My rummaging around in junk shops sometimes reaps great rewards. 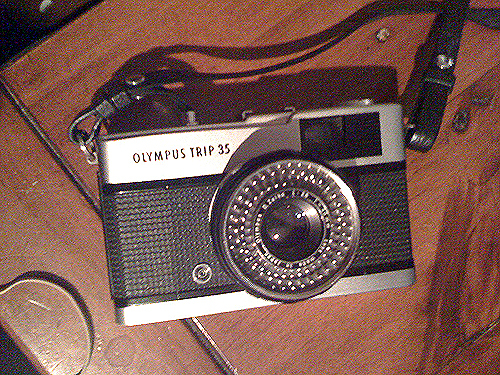 On my recent hunting expedition I found an Olympus Trip 35, another film camera I was searching for. The Trip 35 is a 35mm compact camera, manufactured by Olympus. It was introduced in 1967 and discontinued, after a lengthy production run, in 1984. This camera makes use of a selenium photocell to select the shutter speeds and aperture let novices use the camera as a “point & shoot”, unfortunately this does not work on mine. The Trip name was a reference to its intended market – people who wanted a compact, functional camera for holidays. During the 1970s it was the subject of an advertising campaign that featured popular British photographer David Bailey. Over ten million units were sold. Image above taken with a Pentax Spotmatic 35mm Camera – August 2012. 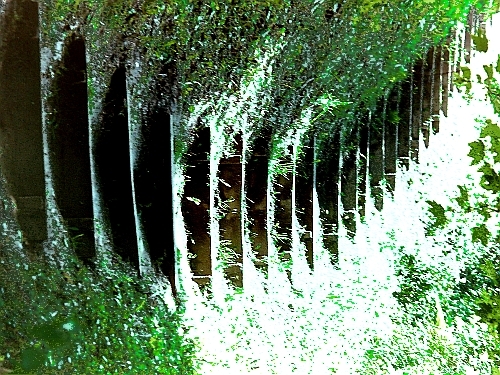 Here is another photograph taken with vintage Pentax camera I purchased of ebay on the 15th July 2012. The Pentax Spotmatic takes M42 screw-thread lenses and was introduced by Asahi in 1964, it was the first SLR … Continue reading ? My blog has reach number 1 in the top printing blog charts today. 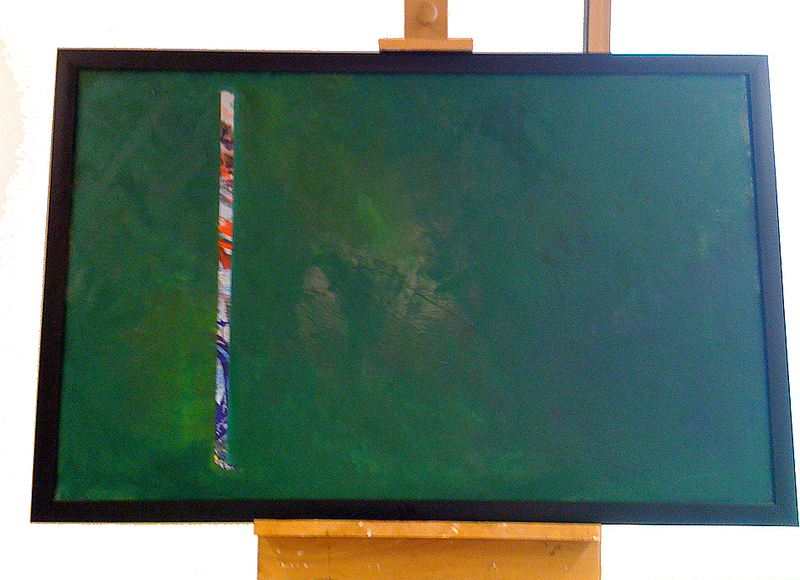 I have begun to work over a screen printed canvas (the painting below is the one I have reworked) in the studios of West Buckland School, to illustrate/show a student how to edit a painting. It is important to remove all the noise from a image to get to a meaningful statement – too much clutter, to much overkill detracts the eye from the real deal. The image above is a photograph I took with a Pentax Spotmatic 35mm camera using ‘old stock’ (March 2000) Agfacolor HDC 200 film. My current preoccupation with 35mm film photography as taught me to look at things again – capturing the odd moment or peculiar juxtaposition. The colours and layout are similar to the painting I have created from the screen printed painting below (I will post the finished painting image soon). “Reflections Ilfracombe Harbour Jubilee Day 2012? 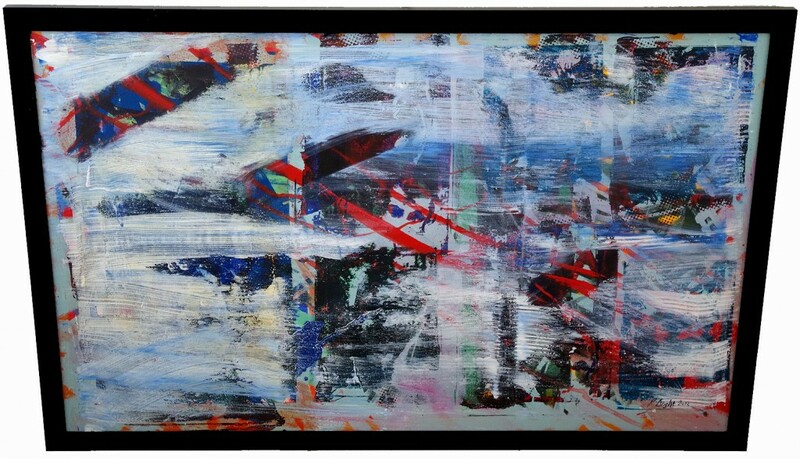 The composition of this painting is based on a Union Jack and is a combination of screen printing and painting. The reflections in the harbour in Ilfracombe always amaze me – the dirty sea water mixed with the vivid colours of the reflected boats, the bobbing flotsam and jetsam, the sunlight and oil spills. 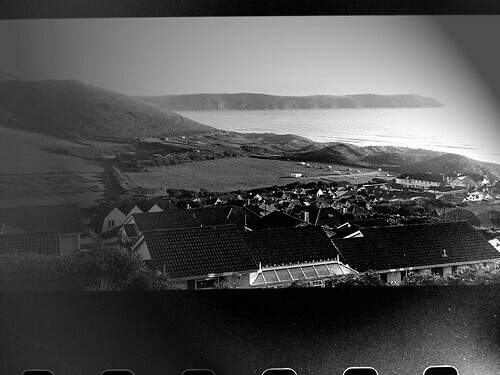 The photograph above (Woolacombe (darkroom error), a photo by 35mm_photographs on Flickr) was taken looking down on Woolacombe using a Pentax Espio 120mi and Ilford HP5 Plus a 35mm black and white film. More on HP5 here? I took this image in September 2012, on the water front, in Falmouth, Cornwall. 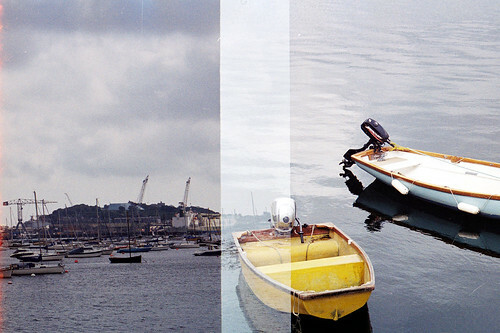 Falmouth boats, a photo by 35mm_photographs on Flickr. I haven’t used a 35mm camera for years. 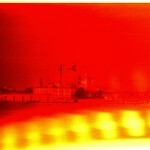 I recently decided to take my old Pentax K1000 with me to Venice. I took some great black and white shots from our hotel window, looking out over the Grand Canal towards … Continue reading ? 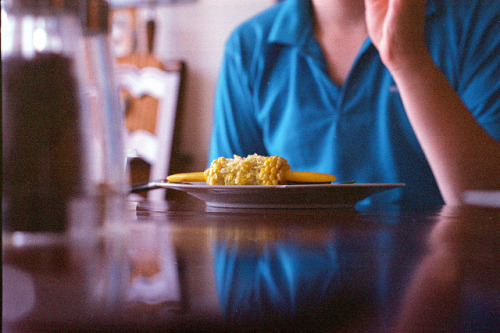 I love film cameras – how unreal are these colours? Taken with my trusty Pentax K1000 35mm camera – September 2012. 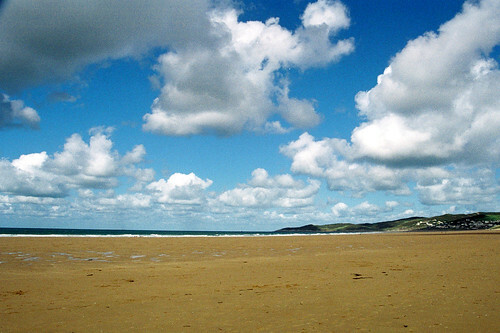 Towards Morte Point, a photo by 35mm_photographs on Flickr. The Pentax K1000 is an almost all metal, mechanically (springs, gears, levers) controlled, manual-focus SLR with manual exposure control. It was completely operable without batteries. It only needed batteries (one A76 or S76, or LR44 or SR44) for the light metering information system. This consisted of a center-the-needle exposure control system using a galvanometer needle pointer moving between vertically arranged +/– over/underexposure markers at the right side of the viewfinder to indicate the readings of the built-in full-scene averaging, cadmium sulfide (CdS) light meter versus the actual camera settings. The meter did not have a true on/off switch and the lens cap needed to be kept on the lens to prevent draining the battery when the K1000 was not in use. 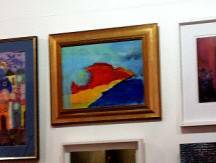 Are you a struggling #artist in #Ilfracombe? A Spanish website written and optimised for UK clients? I cant believe how much oil paints cost – I’m going to have to charge for my paintings by the square inch (or centimeter) from now on. The photograph above was taken with a Pentax K1000 35mm film camera in the studio of West Buckland School in the 150 building – September 2012. 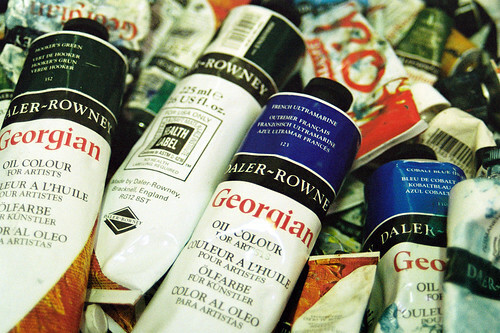 Tubes of oil paint, a photo by 35mm_photographs on Flickr.